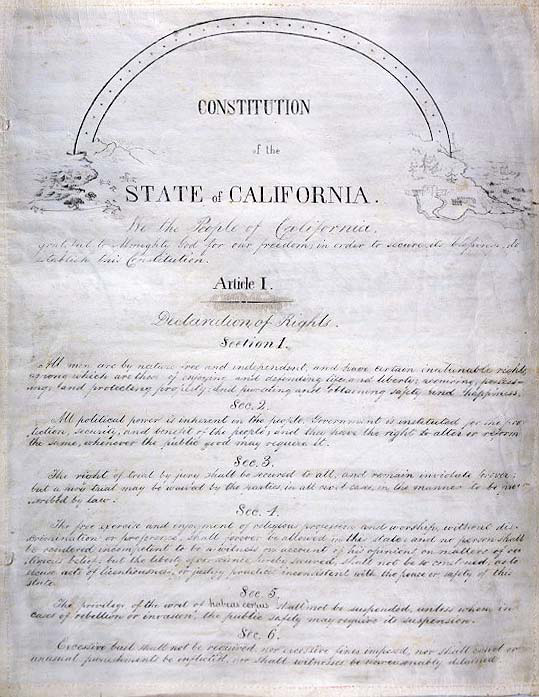 California Secretary of State Alex Padilla and the California State Archives, in partnership with the California Museum and the Foundation for Democracy and Justice, will be hosting a rare public display of the original 1849 state Constitution on September 9 to celebrate 165 years of California statehood. Display of 1849 Constitution — both English and Spanish versions — from 10:00 a.m. to 5:30 p.m. Reception featuring California’s birthday cake from 3:30 p.m. to 5:30 p.m. Program with remarks by California Chief Justice Tani Cantil-Sakauye and Secretary of State Alex Padilla at 4:15 p.m.
Free admission to the California Museum’s exhibit on California statehood from 3:30 p.m. to 5:30 p.m.
Free admission to the State Archives new exhibit about the office of the California Secretary of State from 10:00 a.m. to 5:30 p.m.
More program details to follow. Please mark your calendars to join in this celebration!